If possible, we will accommodate drop-ins, but will give preference to those who sign up in advance. We are also planning another Anti-Racist Yoga Convergence in Raleigh on November 4th. Mark your calendars, spread the word, and join us for either/both of these conversations. By Donation – All proceeds will go to people of color-led efforts to end racism. Black lives matter. And yet, as a nation we continue to tolerate the murder of black people by the police, security, or armed vigilantes at a rate of one every 28 hours. * We have to do more, must do better. We are compelled to act. Our collective survival literally depends upon our capacity to show up with our whole selves, right now, and act to protect and defend black people, and build a world of collective safety and liberation. If you’re not sure what we mean by this, please come and we’ll explore it more. The purpose of spiritual practice is to increase our capacity for compassionate action. Now more than ever, we are invited to flex our heart muscles and answer the call to reclaim our shared humanity; our practice can support us in showing up fully in this work. In holding compassionate space for our own and others’ feelings. In sticking with it even when it seems hard, uncomfortable, even overwhelming. We are called to use all our tools and skills to co-create the world we want to live in, one in which we can fully inhabit our whole selves and complex identities One in which we are all truly free, one in which we all get to thrive, one where everyone can feel connected. Join Patty Adams and Michelle Johnson in a three hour anti-racist yoga convergence. The first time we held a space like this–this past July in Durham–we found that two hours was simply not enough. We know three hours is a bigger investment, and we think it’s worth it. Please note we will not be doing yoga asana (postures) for three hours! This will include some yoga, along with discussion, self-reflection, and other components. As a multiracial teaching team, Patty and Michelle collectively have 38+ years working to dismantle racism and oppression, as well as 26+ years studying and teaching yoga. Michelle is a therapist, anti-oppression trainer with Dismantling Racism Works, and yoga teacher trainer; see more about Michelle online. 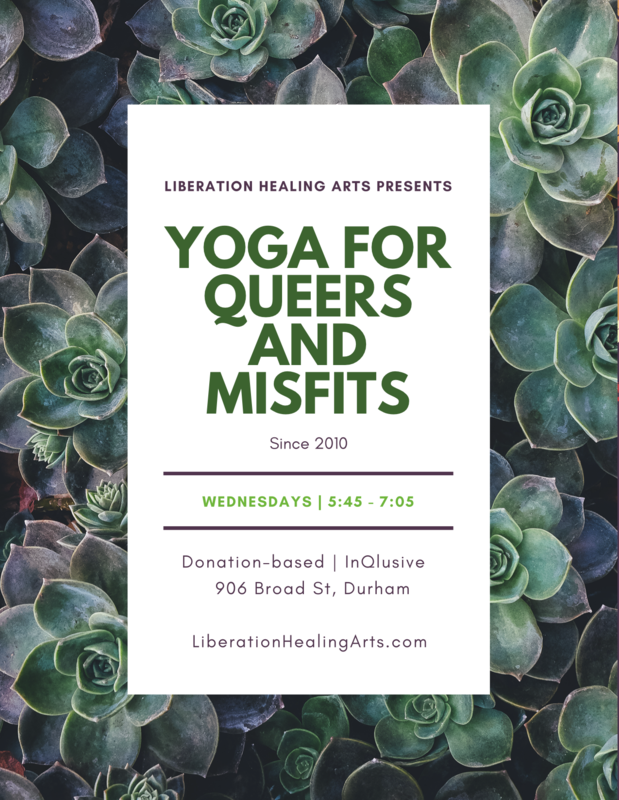 Patty organizes locally with Triangle SURJ (Showing Up for Racial Justice), and is also a therapist, bodyworker, yoga teacher, and founder of Yoga for Queers and Misfits in Durham; see more about her here. This space will weave together the tools and practices of yoga and anti-racism, combining physical yoga (asana/postures) with other practices including life-giving breath work, self-reflection and collective conversation. You’ll also be given tools and resources to support your own commitment to the work of dismantling racism and white supremacy, to building a world without police violence, and to supporting the fullness and freedom of the black people and people of color in our communities. Show up and answer the call of your own heart to move beyond fear, discomfort, and a sense of scarcity into your rightful place as a potent warrior of the heart, a liberationist, a radical catalyst for transformation.